WHAT A pity that Sutton United’s night to remember was slightly tarnished by the behaviour of a few people who have probably never set foot inside Gander Green Lane before. Attention-seeking arrivistes hanging on the crossbar (which would cost the club significantly if it were to break), throwing punches and probably attempting to goad Arsenal fans, are the type of people who denied some genuine football folk around Sutton the chance to see a memorable match. It is doubtful if Arsenal fans were out to cause a disturbance, they are not a club that generally has a lunatic fringe, but whenever a big clubs rolls into town, the unsavoury element turns up and tries to show the visiting supporters that, “this is our manor, come and give us a try”. We’ve seen it at smaller places than Sutton and it is important that the outside world are made aware that whatever their allegiance, these are not the people who watch the club week-in, week-out. That aside, Sutton United, renowned for being a highly respected but conservative outfit until a few years ago, have good reason to rejoice. On the field of play, they performed well and might have had a consolation goal to celebrate. Their story this season is also a reward for a club with some real foresight – their policy around season tickets has been nothing but imaginative and it has been repaid with bigger gates, promotion and now the sort of publicity that you cannot buy. Good for Sutton United, good for Paul Doswell. Right now, Arsene Wenger probably doesn’t want too much publicity, but he’s manager of Arsenal and you don’t have to work hard for it when you’re in the dugout at the Emirates. When a manager needs bodyguards, you know there’s a degree of neurosis around and right now, there can be no more neurotic club than Arsenal. A 2-0 win away at a National League club in the FA Cup cannot erase the mess that Arsenal’s season is threatening to become. As a bunch of players, they are not too far away from having a very decent team, but that’s been the same story for a decade. Every false dawn is followed by an early year admission that “things must change” and the Wenger issue becomes top of the agenda once more. A regular exit at the last 16 stage of the UEFA Champions League is usually one of the first triggers. At Bayern Munich’s Allianz Arena, Arsenal and Wenger surely started divorce proceedings – a lot of teams lose 5-1 in Werner-Heisenberg-Alle, but very few are of the calibre of Arsenal. Wenger had a bigger hangdog look than normal in Munich, but he’s supposedly stubborn enough to wait until the summer before announcing his next move. But should it be down to Wenger to dictate the narrative? Should the Arsenal board not be the people making a decision? The fact they remain silent is indicative of two things – firstly, to their great credit, Arsenal are not a “shouty club”, they have reasonably sound principles. Secondly, from a business perspective, Arsenal’s stakeholders are probably quite happy with the stable performance of the club. Arsenal’s revenues in 2015-16 totalled EUR 470m and all major income streams increased significantly. If you were a shareholder of Arsenal, and there are precious few, you would be pretty satisfied about the way the club was being run. So what is the answer? Arsenal have to be more communicative on the issue, either backing Wenger or forcing an earlier decision than the summer. They don’t need to worry about season ticket sales, they have a mile-long queue for people waiting to get inside the Emirates. In the meantime, Wenger should do the right thing for the football club and signal the end of his reign and allow the club to move on and start to sound-out successors. The problem is, Arsenal’s timing is not particularly good. The list of top notch candidates is not especially long: Klopp and Guardiola, both ideal for a club like Arsenal, are settled, Carlo Ancelotti is one year into his project at Bayern Munich and likely to be involved in picking up silverware and Mourinho (not a good fit) is at United. Like Mourinho, you cannot see the highly talented and volatile Diego Simeone moving from Atletico Madrid to the Emirates. If Arsenal were brave, they might seek-out the likes of Julian Nagelsmann of Hoffenheim or Thomas Tuchel of Borussia Dortmund. And then there’s the resting actor Laurent Blanc and bookmakers’ favourite Massimiliano Allegri of Juventus. Whoever ends up at Arsenal, they have the clout to snare almost anyone available and they should use that power to ensure Wenger’s departure is the start, rather than the end, of something. But do it now and allow Wenger the opportunity to play-out the 2016-17 season more relaxed and in harmony with the supporters. Once Arsenal regulars know that Wenger’s time is coming to an end, the dynamic will surely change and his achievements will not be overshadowed by the relatively stagnant pool of under-achievement that has characterised the period since 2004. 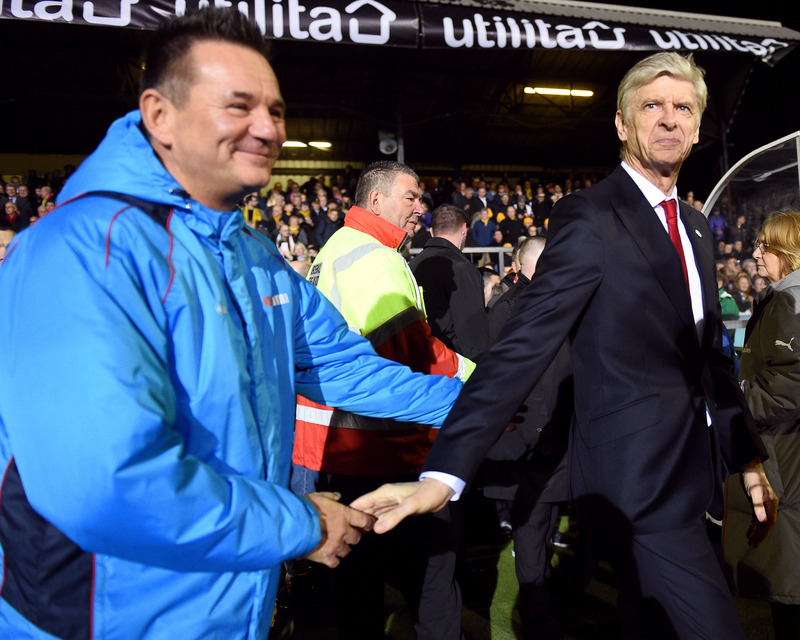 Arsenal’s win at Sutton United sets them up for the last four of the FA Cup. They will surely beat Lincoln City, another club that deserves enormous praise for their efforts, and then they are just one step from the final. Wenger, in all reality, could bow-out with some silverware, probably a top four placing and the goodwill of the North London public. Better that than seeing the one-time great innovator kicking and screaming his way to Ligue 1.